What are the most common reasons to use auricular therapy? It can be used for many different disorders and is most commonly used as an adjunct therapy to acupuncture when treating pain, smoking cessation and weight loss. Like acupuncture, this is a holistic approach to healing, an approach that treats the whole person. 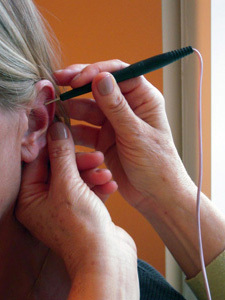 The acupuncture points located on the ear help to regulate the body’s internal organs, structures and functions. Auricular therapy has been shown to stimulate the release of endorphins, the body’s own ‘feel good’ chemicals. It has a high success rate for migraine, hay fever ailments, smoking cessation and pain relief. Auricular therapy works by stimulating the central nervous system through the cranial and spinal nerves via the auricle of the ear. This stimulation results in neurotransmitters modulating the pain and/or the nerve function to begin the healing process within the body or to that body part. When you can’t be in our clinic, use ear seeds. These seeds from the Vaccaria plant are held in place on the ear with a small piece of adhesive tape to stimulate the body’s natural healing abilities for a longer period of time. They may be employed for a few days or up to two weeks.